Balloon baby shower games we found to make your co-ed or couples baby shower party a hit for everyone. Most of these games take very little prep work so use the balloons to decorate the event and then use some to play games. They are cheap and fun to work with. Playing any of these baby shower balloon games might sound weird and crazy but trust me when I say they are ridiculously fun. Diapering shower games are always a welcome hit. This one sounds good on paper but try getting a diaper on slippery balloon. This game is all about the guys getting in on the action. Ok so we think most of the guys will be wearing shoe with laces but just in case they are not as long as they have on shoe and sock then they qualify. Ask the men to stuff a balloon up their shirt, in essence creating a guy pregnant tummy. Then they will sit and remove their shoe. On the word go those who have laces will have to put on their shoe and do up their laces while those without laces will have to put their socks and shoe on. The lucky winner is who finishes first. Tell Players to strike a pose after they fit a balloon under their shirt or dress. Then let mommy to be decide who is rocking the next best tummy…after hers of course. Give each player a balloon and tell them the blow it up and tie it off. Then they all have to fit it under their tops to for judging. Guys are encouraged to play so don’t be afraid to get them in the game. The tricky part about this game is that you won’t tell them the rules of the game until after they blow up their balloons. 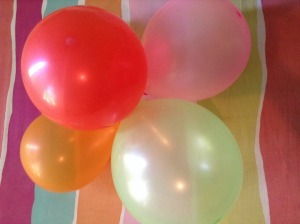 To super charge the fun factor use varied size balloons and let guests choose. We love, love this one because it gets everyone laughing. It’s ridiculous fun. Pair up players and they have to get their balloon to pop between each other without using their hands. Tell guests to look at the pregnant lady and blow up their balloon to what they think is a close size to her tummy. Everyone should place their balloon under their shirts and mommy will examine and determine the closest bump compared to her belly. Of course we could not leave out the gender reveal party balloon idea. Ok so how cute does balloons-in-a-box sound to you? Super cute right. At the party mommy and daddy will open a giant box filled with pink or helium balloons that will float up revealing the gender. Return to top of Balloon Baby Shower Games where you can choose other games from the top navigation bar. Go to Co-ed Baby Shower Games for more party game ideas.